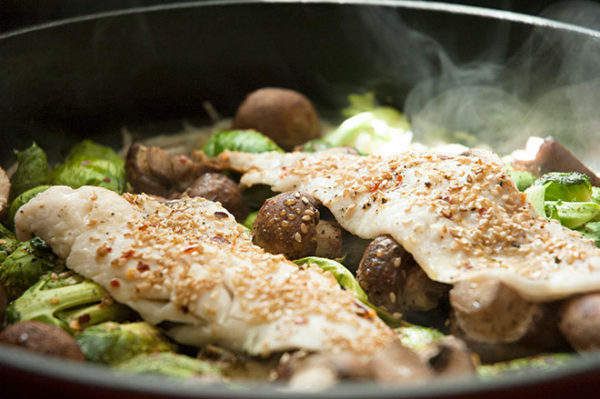 UPDATE: The Fish and Veggie Skillet recipe is now available on Knuckle Salad. Call it arrogance if you like—that’s what I call it, and it always comes running—but when Alex and Kenan from PeachDish invited me to plan a menu for one of their weekly meal kits, I felt I had been called to duty. 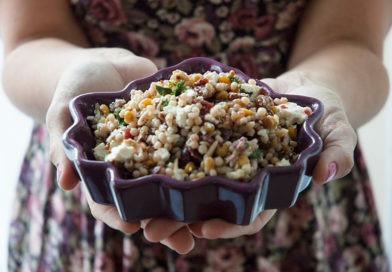 What other chance would I have to bring a glorious Knuckle Salad recipe straight to the actual doors of readers, with all the locally-sourced ingredients pre-portioned and measured, and hell, even a little something for dessert after? This wasn’t just an opportunity for me, it was an opportunity for society. Think of all the people who would benefit! It was the right choice. It was the only choice. And it was kind of like seeing my name in lights, but not lights so much as a tidily cold-packed shipping box. Just as good. Cold packs are awesome. Of course, then I had to decide what dinner to send America. I wanted to choose something that my own family is enjoying right now, rather than relying on an old favorite. And I’m seven months pregnant, so I’m focusing pretty hard on hitting that sweet junction where really, really healthy meets really, really tasty and really, really, really easy. I’m doing my best to stick to an exclusively healthy diet—vitamins and minerals and protein, balanced complex carbohydrates, nutritious fats—on account of Mr. Baby. But I tire of healthy things rapidly, so I must constantly work on exceptionally delicious solutions in order to keep enjoying an unwaveringly veggie-first lifestyle. And I’m lazy. I’m round and lazy and I don’t like to do dishes. So. That’s my inspiration. Every day. There’s one meal I’ve been making a lot this spring, and it’s so good that we just never seem to get bored with it: Fish & Veggie Skillet. It was such perfect fit for PeachDish that there was no question whether this would be the dish to go in the box. I nailed down the best and simplest way to prepare it, measured it all out, wrote it up and sent it over. And since we are living in The Future Age, PeachDish customers will receive my recipe as a kit in a box next week. (That includes new PeachDish customers, as long as they order their box by Monday the 14th, 2014.) I find this super cool. I feel like I’m dispatching grocery-agents to your houses. I feel like the mushrooms are doing recon on all your kitchens. I’m certain there will be no recon but I feel like there will. I will wait by the phone just in case. Just in case the mushrooms call. To tell me whether you cook over gas or electric. Again, I assure you that this will not happen. So, about the Fish & Veggie Skillet! I’ve been making Brussels sprouts a couple times a week for a while (also artichokes—so good for you! 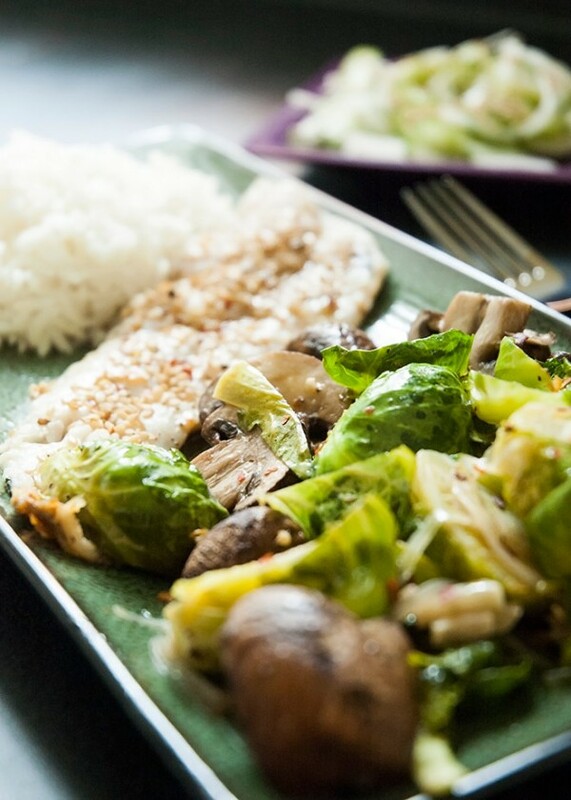 but they’re not in this recipe), and I stumbled upon a really tasty, really simple approach to preparing Brussels sprouts, mushrooms, and fish all in one skillet. 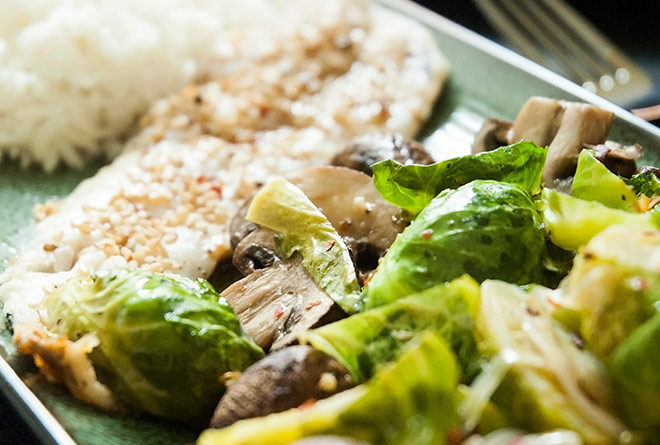 The mushrooms release liquid that cooks and softens the Brussels sprouts, which have been lightly browned and make the mushroom liquid richer as they cook. Then that liquid steams the fish, so it stays moist. 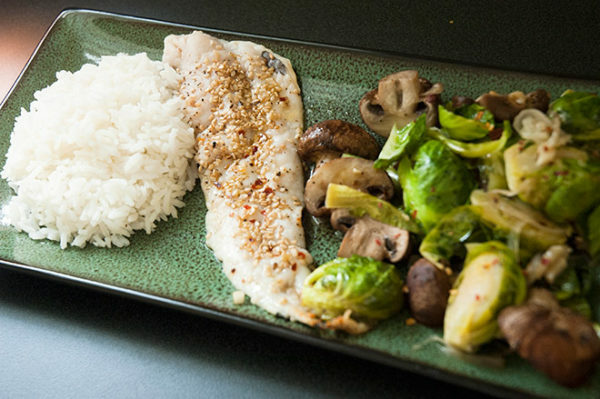 Everything is seasoned with sesame seeds and chili pepper, and in this case, served over a bed of jasmine rice for a special treat. Because whole grains are great but they’re nothing compared to jasmine rice. NOTHING. I’m pretty sure I even felt this way before I was pregnant, which means you can trust me. This is just a preview. 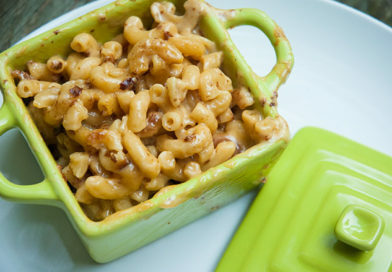 I’ll share the recipe next week (update: it’s right here! ), and in the meantime, if you want to try it but aren’t excited to go to the grocery store, I encourage you to consider grabbing next week’s box. Having tried it myself, I can say with certainty that it’s a pretty awesome luxury to have two different meals show up all bundled up and ready to make whenever you feel like it. 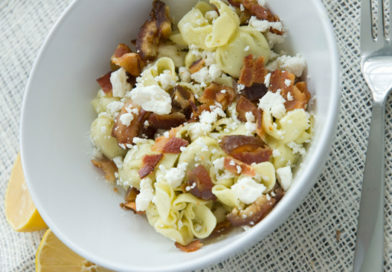 Oh, and the meals include easy appetizers! 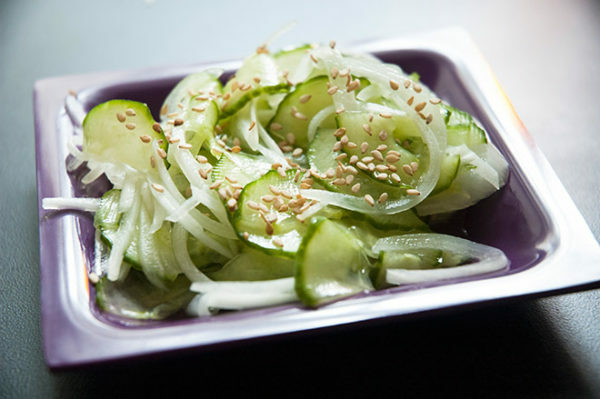 Mine is a little cucumber salad. It’s nice. You’re gonna like it. 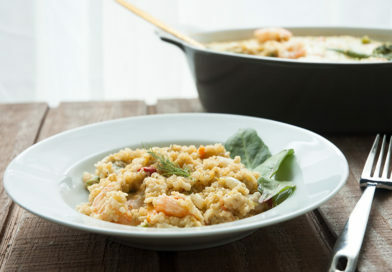 Plus it looks like both of next week’s recipes are served with jasmine rice! So that’s another thing to be stoked about. I love you, jasmine rice.